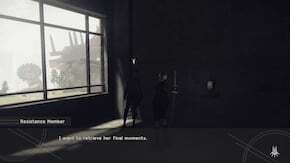 Amnesia is a Side Quest in NieR: Automata. "You found an exhausted Resistance woman in the city ruins who claimed to have been caught in a huge explosion. She has no memory of events before or after the shock, but does possess a broken Pod with her friend's final moments recorded inside. Hack into the Pod and recover the life log." "After hacking the Pod, you learn that the woman's friend was killed by another Resistance member clad in a red hood. Head to the Resistance camp and catch the perpetrator... er, red-hooded." "The person you found says the red hood was a present from a resistance woman who's stationed in the desert. Go to the desert garrison and find where the red hood came from." "You couldn't find the Resistance woman you were looking for in the desert garrison. According to the man there, she was last seen in the desert caves. Go there and search her out." "According to the woman in the cave, who turned out to be Jackass, she bought the red hood from a red-haired Resistance woman - a description that sounded an awful lot like the amnesiac woman you met in the ruins. Go back to her and get the real story." "The Resistance woman looked uneasy at the suggestion the hood originally came from her. She asked 9S to retrieve more of the life log from the broken Pod in hopes of finding the whole truth. Hack deep into the Pod's data bank and see what you find"
"Seeing more of he life log, the Resistance woman's lost memories came rushing back - it turns out she was a YoRHa Type E. Hiding her true nature, she blended in with the Resistance to rout out fugitives and traitors, with her final victim being a dear friend. Wracked with guilt, Type E erased her own memory. The sudden return of this tragic memory ended up leaving her shaken and unstable." Hack the Pod once more. The quest unlocks after the Assault event in City Ruins. To start it, travel to the building where you started fighting Engels during assault and inspect the lower floors to find the shocked resistance member and talk to her. Go to the Resistance Camp. Go towards the storage, but turn left when you climb up the ladder - talk to a woman with a red hood. You will then ned to head out towards the Desert Camp to talk to Jackass. She is not there, so go into the nearby caves in the Desert Zone to find her. Return to the City Ruins and talk to the client. I might have missed something but the quest dialogue gets a little weird when you approach Jackass. I mean you&apos;ve met her at least twice already (once in the dessert and another under city ruins) yet the dialogue seems to imply that you don&apos;t know her. any know the ending song ? On weird bit...the closing dialogue has 9S telling 2B he had no idea there was an E-series, but 7E was a member of 2B&apos;s squad that he was supposed to be the support unit for.